The road rules in Tasmania help protect cyclists. Everyone has the right to use the road safely. Cyclists don’t have the protection of a vehicle but interact with them. And a bicycle is harder to see. That’s why distance makes the difference. Drivers need to always be alert to cyclists who should be as visible as possible. Bright clothing and flashing lights – white on the front, red on the back – helps visibility. Cyclists can travel two abreast, not more than 1.5 metres apart and take the whole lane if necessary to be visible. The new laws will help improve their safety and as well as pedestrian traffic. If you believe a driver has been within the 1-metre or 1.5-metre passing distance, you can make a complaint to police. A high standard of evidence to prove beyond reasonable doubt that a person is guilty of breaking the law. Cyclists can ride across pedestrian crossings, marked foot crossings (controlled by lights) and children’s crossings. At pedestrian crossings with lights, the same rules apply to cyclists as pedestrians. Cyclists must not cross the road when the pedestrian lights are red, and only cross the road when the pedestrian lights are green. Drivers must give way to cyclists and pedestrians on a pedestrian crossing, marked foot crossing or children’s crossing. Drive on or over continuous lines around a painted island but only if they have a clear view of oncoming traffic and can pass safely. The law applies to all roads, even where there are bicycle lanes. After passing, check for the cyclist in their mirror before moving back into the lane. If it’s not safe (for example the road is too narrow or the view ahead is not clear), then drivers must slow down and wait until road conditions change before passing safely. When passing cyclists riding two abreast, drivers need to provide a minimum safe passing distance (either 1 or 1.5 metres) between them and the cyclist closest to the driver. 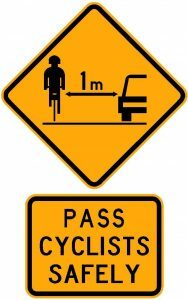 There are cyclist warning signs on roads popular with cyclists, to remind drivers of the safe minimum passing distances. Explore the Cyclists Warning Sign locations.